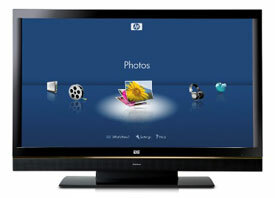 HP today announced that it is making the video content of YouTube available through its MediaSmart “smart television” products, including the upcoming MediaSmart Connect digital media receiver and the high-definition MediaSmart TV. HP joins Apple and others in a growing field of companies trying to make viewing Internet media on your television as easy as watching traditional television. HP worked with YouTube to make it possible for people to watch and share full-screen videos on their HDTVs and to create multiple playlists from anywhere they watch TV: Viewers simply log into their YouTube accounts with a remote and start watching videos. MediaSmart products aggregate digital media from multiple networked home PCs into one easy-to-view menu for HDTV playback using a remote control. Using HP MediaSmart products, users can access dozens of services from the Internet, including movies from CinemaNow, photos from Snapfish, and Internet radio from Live365.